If you’ve ever visited our flagship Granville Street café, you’ve certainly seen our big coffee roaster right in the store. That coffee roaster isn’t just decorative; every day, we roast our organic coffee beans in-house, creating the flavourful coffees that you know and love. You already know that the flavour of your coffee depends on where the coffee is grown around the world, and how and when the coffee beans are harvested. There’s literally a world of coffee flavours available for tasting. 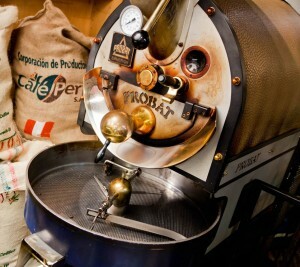 One of the biggest factors in the taste of your cup of coffee comes from how it is roasted! The flavour of green coffee beans is utterly different from what you get after you apply the heat – it’s all in the chemical reaction that brings out the best in the beans! We roast our coffee beans in small batches to ensure every bean gets the attention it deserves. No computer controlled devices here; our Roastmaster uses his sense of smell, sound and sight to determine exactly when the coffee is perfectly roasted. This process hasn’t changed much in a hundred years! We start by heating up the roaster to a blistering 500 degrees, then in go the green beans – the point at which the magic starts to happen and you can create balance and complexity in the taste. 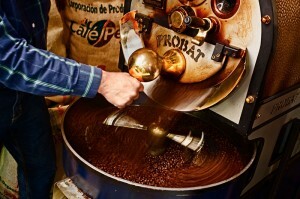 The beans tumble in the rotating drum to make sure that the batch gets an even heat distribution. The beans are only in the roaster long enough to get the coffee oils to react and bring out the taste, without too much carmelization. The first “crack” tells us it’s ready. It’s very much like popping popcorn! This light roast is typically called “Light City” or “City” roast. Shortly after the first crack, we listen for the second crack. The beans are now perfectly balanced with a good amount of flavour complexity and more than a hint of smokiness. Also called “Full City” roast, this is the degree of roast we prefer for the coffees we serve. Also referred to as “French” or “Italian” roast, although quite strong, has unfortunately lost the acidity and the aroma has been diminished. The time difference between a medium and a dark roast is literally seconds, so our Roastmaster needs to be quick to dump the beans from the drum at precisely the right moment. Once they come out of the roasting chamber, the beans need to be cooled down as quickly as possible to prevent them from continuing to roast even further from their own retained heat. A circular tray with rotating arms stir the freshly roasted beans while a fan underneath the tray draws cool air down through the perforations in the cooling tray. Roasting coffee is a mix of art and science. As we bring in coffee beans from exotic lands around the world, we test out different roasting times so we know how best to present them to you so you get the perfect balance of acidity, body and aroma. Each batch has its own unique roasted qualities!